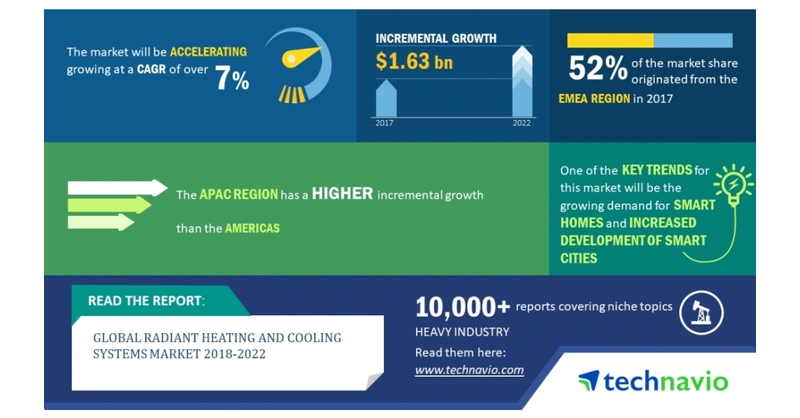 LONDON–(BUSINESS WIRE)–The global radiant heating and cooling systems market is expected to register a CAGR of more than 7% during the period 2018-2022, according to the latest market research report by Technavio. A key factor driving the growth of the market is the growing need for energy-efficient cooling and heating systems. Both the resident and commercial users prefer radiant heating and cooling systems because of their low operating expenses. These energy-efficient radiant heating and cooling systems allow users to achieve the goals outlined in engineer-to-order building plans. Thus, the need to achieve higher energy efficiency has promoted the sales of radiant heating and cooling systems. This market research report on the global radiant heating and cooling systems market 2018-2022 provides an analysis of the most important trends expected to impact the market outlook during the forecast period. Technavio classifies an emerging trend as a major factor that has the potential to significantly impact the market and contribute to its growth or decline. Owing to the growing technological advancements, the smart home concept has gained much popularity in the recent years as consumers are focusing on improving their lifestyles. In the residential and real estate segments, the development of smart homes is an evolutionary concept, with the major aim of making life more convenient, comfortable, sustainable, secure, and entertaining. “The smart home technologies, which make use of advanced sensors, have become affordable. Such technologies permit appliances such as lighting systems, heating and cooling modules, television sets, computers, and camera systems to be connected electronically. This allows homeowners to control these appliances through smartphones and tablets,” says a senior analyst at Technavio for research on unit operations. This market research report segments the global radiant heating and cooling systems market by technology (hydronic and electric), end-user (residential and non-residential), and geography (the Americas, APAC, and EMEA). The hydronic segment held the largest market share in 2017, accounting for over 68% of the market. This technology segment is expected to dominate the global market throughout the forecast period. EMEA led the market in 2017 with more than 52% of the market share, followed by the Americas and APAC respectively. EMEA is expected to dominate the market throughout the period 2018-2022.